Over the weekend Rohith, Xavier, Albert and I (Yi Fan) came in 2nd runner-up at SG100-Nation-Hackathon which was held at Tanjong Pagar CC by SG100 Foundation. During the 2-day hackathon, we created a CPF financial planner app to help working adult Singaporeans plan towards their retirement, children’s education, health, and housing goals. We aimed to ensure Singaporeans are thinking ahead for their future, at every stage of life. The problem statement was “Singaporeans do not know what, when and how to conduct financial planning for their retirement. How can we educate them to manage their finance and achieve financial security during their retirement”. We took this opportunity to leverage on a common problem Singaporeans face - planning for their retirement. In fact, 47% of active CPF members do not meet their Full Retirement Sum by age 55. 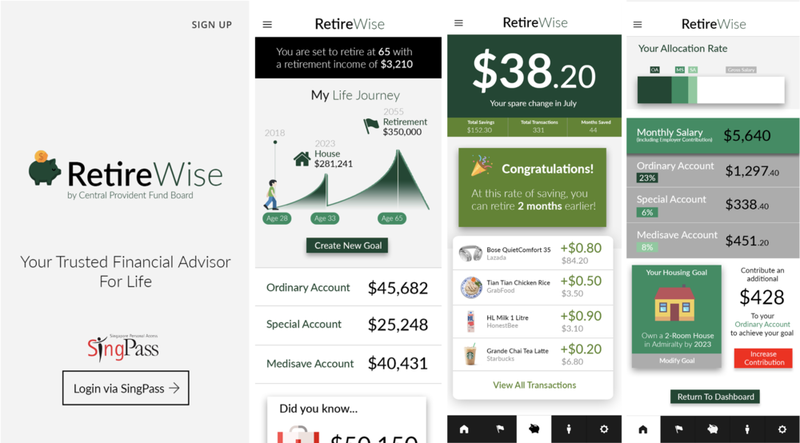 Our prototype app, RetireWise, aims to alleviate Singapore’s retirement planning problem by allowing users to visualise and plan their entire life journey up until their retirement. Visualise your retirement journey: Have your financial journey planned out for you? Now you can instantly visualise your retirement goal, among others, and be able to work towards it. Goal-based investing: Set your housing, education, health and housing goals, then let us plan how you can achieve those goals. Receive prompts to top-up your monthly contribution if your current contribution is insufficient. Spare change feature: Let’s say you buy chicken rice for $3.50. We round it up to $4 and save the 50 cents change into your CPF account. Saving all the spare change that you don’t really think about can really add up and make a sizeable contribution to your CPF account. The hackathon was held over a span of 2 days. We spent Day 1 brainstorming and Day 2 working on the prototype. Unlike other teams who spent time ideating on product details, we were able to come to a consensus fairly quickly. We knew from our experience at Bambu that our financial planning app had to be easy to use and intuitive to the user with robust capabilities behind-the-scenes. On the last day, we finished refining our prototype and started building the pitch deck. While preparing for our pitch, we sought inspiration from pitches at other competitions, such as Bambu CEO Ned’s pitch at Finovate. Given just 3 minutes to present, we knew that clarity was key. The hackathon was a rare opportunity to seek feedback on our solution from industry professionals and government representatives. With the opinions we have gathered, we are now even more keen to see our solution implemented in the near future. Overall, I thoroughly enjoyed the hackathon experience with my friends from Bambu. If you want to find out more about the project or have other questions, get in touch with us at info@bambu.life. Newer PostIssue 25: July Newsletter - Franklin Templeton has led our US$3 million Series A round.